"Professor Holladay's reputation for precision while simultaneously entertaining his audiences with spellbinding episodes from the past continues unabated in his magnificent retelling of Luke's account of the continuation of the life-transforming events of Jesus, Lord and Christ, into the movement of his apostles from the center of Jewish faith in Jerusalem to the vortex of the nations in Rome. In his own inimitable way, Carl Holladay combines accuracy of description in summoning events and personages and cultural-classical texts critical to Luke's telling, while at the same time extracting with magnetic-like force their importance in the much larger theological-missional intent of Luke's interactive narrative arc. As a highly skilled historian, Holladay enables the lasting significance of Luke's kerygmatic message to present itself from within the historical-literary-cultural contexts that he highlights so well. His new telling will soon become the commentary of choice for scholars of antiquity and people of faith." 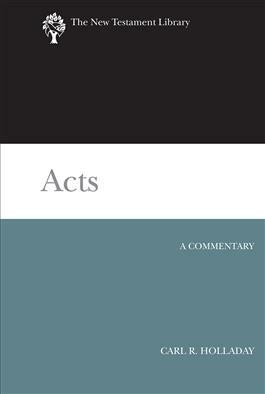 "Based on a lifetime of reading Acts and texts from both the Jewish and Greco-Roman worlds, Carl Holladay has produced a commentary on both Acts and the world in which it was set. This is erudition devoted to a contemporary reader. It is historical-critical scholarship at its very best. I highly recommend it to all who take the text seriously."